About 500 members of the migrant caravan tried to “violently” breach the border with the U.S. just south of San Diego, California. They have been arrested by Mexico and returned to whence they came. The 500 migrants first tried to get past Mexican federal police on the south side of the port of entry between Tijuana and San Ysidro (a district of San Deigo). When the Mexican police in riot gear lined up and set up a barrier, but hundreds of the migrants pushed past the blockade of Mexican police and rushed toward the border. One of the Mexican officers trying to keep migrants from the area got into a scuffle and appeared to suffer a cut lip. A group of several hundred migrants took off toward the concrete banks of the Tijuana River, which they crossed on foot to reach the border fence on the river’s north side. U.S. authorities appeared to deploy less-lethal ammunition and flashbangs at the group, and people scattered. Customs and Border Protection officials said on Twitter that Border Patrol agents deployed tear gas after several agents were hit by projectiles thrown by migrants. You can see the moment when the crowd-control measures kick in. Suddenly, the would-be border-rushers can’t get back into Mexico fast enough. Mexico will deport almost 500 migrants who attempted to storm the US border, according to its interior ministry. Mexico’s interior ministry said all those who were identified as having tried to cross would be deported immediately. It added that, “far from helping their objectives”, the migrants’ actions had violated the legal migration framework and could have led to a “serious incident”. This is the first of probably many incidents we will see of the migrant caravan trying to break into the country. This time the US border patrol and the Mexican Federales were able to hold their ranks, hopefully, they will receive all the tools they need to hold them off in the future. Knowing the border is a priority for President Trump, I am sure they will. 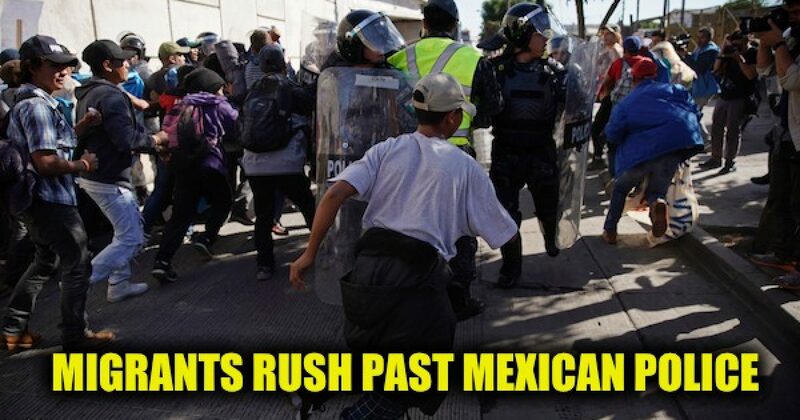 The liberal media will still the caravans peaceful…at least those in the liberal media who will acknowledge the caravan exists.